The number of prosecutions for fly-tipping in Scotland has fallen by two-thirds over the last three years, according to official figures. Responding to a Freedom of Information (FOI) request, the Scottish government reported six successful prosecutions in 2017-18, compared with 18 in 2014-15. Campaign group Zero Waste Scotland described the fall as "disappointing". Council umbrella body Cosla said prosecution was just one of a range of sanctions that could be imposed. Zero Waste Scotland chief executive Iain Gulland said: "The key to a successful litter prevention strategy is education, infrastructure and enforcement, so it's disappointing to see prosecutions decreasing, as they do form part of that mix. "We have worked to prevent fly-tipping by working with partners to create tools to help tackle it." Mr Gulland said those tools included the national Flymapper mobile phone app-based system, which allows councils to record fly-tipping incidents. He added: "We are working to develop these tools further to provide more accessible and smart solutions for local authorities and other land managers to tackle litter and fly-tipping effectively." Those caught fly-tipping in Scotland are subject to a fixed penalty of £200. Penalties can be issued by the police, local authorities, and - since 1 April 2015 - by public bodies including Loch Lomond and the Trossachs National Park. Someone convicted of fly-tipping can be fined up to £40,000. In addition, the Scottish Environment Protection Agency (Sepa) and Revenue Scotland are able to recover landfill tax from illegally-deposited wastes. A spokesman for Cosla said all of Scotland's councils treated fly-tipping "with the same degree of seriousness". He added: "The figures obtained in the FOI request refer only to cases referred to the procurator fiscal, so only give a partial view of the reality. "Many councils address fly-tipping in the first instance in other and more cost-effective ways, such as fixed penalty notices, referral to community police or verbal and written warnings, with offenders required to remove and dispose of the waste lawfully." A Scottish government spokeswoman said it had provided councils and Sepa with the powers to fine people who are caught fly-tipping. 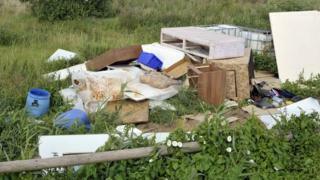 She added: "Fly-tipping is illegal, dangerous and unnecessary. She added: "Valuable resources which could be recycled are wasted and publicly-funded organisations and landowners bear the cost of cleaning up the blight that fly-tipping creates. "Local authorities are primarily responsible for dealing with fly-tipping and the Scottish government has provided them and Sepa with the powers to fine people who are caught fly-tipping, with a minimum fixed penalty of £200 and up to a £40,000 fine if prosecuted."